Christmas tree lanes have become popular sights as part of Gallipolis in Lights. GALLLIPOLIS — Gallipolis in Lights is once again preparing to shine for its sixth coming holiday season with a light ball workshop scheduled Wednesday at 5 p.m. at the Colony Club. Gallipolis in Lights has been continually putting light balls in City Park since the 2013 holiday season. Shari Rocchi and Lance Clifford were credited with starting the lighting event through discussions over social media with the community in order to gauge regional interest. Group members were then gathered and volunteers started to create light balls out of chicken wire. The idea originated with a community in Greensboro, N.C. Volunteers make light balls out of chicken wire by cutting a certain length of wire and rolling it. The balls are then fastened together with zip-ties to shape a globe. Lights are then strung through a ball with typically 50 lights in each ball. For those interested in learning how the balls are created and creating a few of their own, the light ball workshop is a volunteer event. Last year, over 1,300 balls were hung in City Park. In May of past years, GIL has hosted an Electric Walk and Run with participants dressing in neon colors and clothing light displays. Balls are being hung right now with GIL volunteers when able. Placement of annual community Christmas trees for the Gallipolis in Lights Tree Walk will be Saturday, Nov. 17, at 9 a.m. The traditional lighting ceremony will be held Thankgiving Eve, Nov. 21, starting at 5:30 p.m. and the light switch thrown at 7 p.m. Live nativity scenes start Dec. 1 with free hot chocolate and cookies. Gallipolis in Lights annual Gala will be Thursday, Nov. 29. Those looking for tickets may call Amee Rees at 740-446-5005. For more information on how to volunteer, call Shari Rocchi at 740-709-1677. 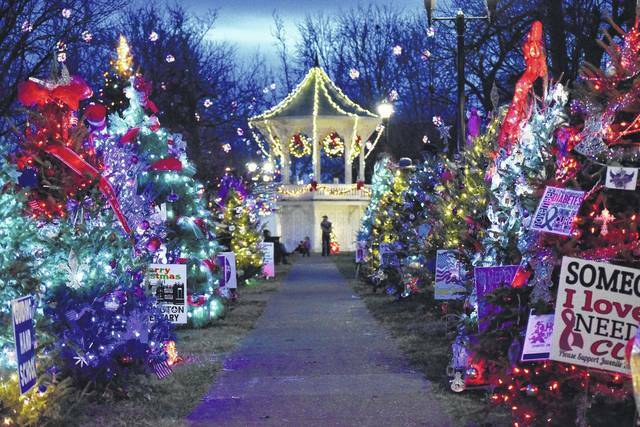 Gallipolis in Lights has traditionally over the last few years added gradual surprises to its City Park exhibition. Music was added a few years back with a stereo system placed in the bandstand and, last year, fireworks were added to the lighting ceremony.